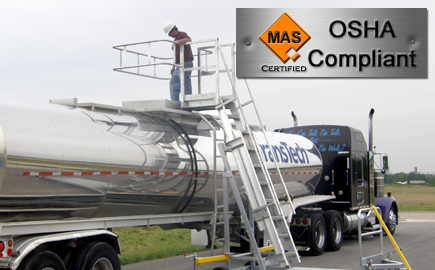 We offer several portable truck access platforms. Pictured is our PTA series unit for loading, unloading, inspection, and sampling applications. 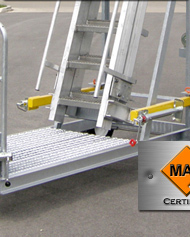 These units provide an additional level of safety when you need to access the top of different types of trucks and will not, or cannot depend on truck installed access ladders or traditional stationary loading racks for fall protection. 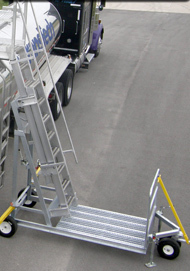 Our portable access platforms come in perpendicular or parallel access models and include the heavier freestanding model you see here and a truck-top supported, lighter weight version not shown. 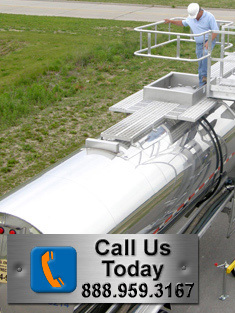 We can customize any of these models to your specific application or site conditions. Perpendicular or horizontal models available. Freestanding design does not rest on the vehicle for support. Rubber bumpers protect the vehicle while the unit is in use. 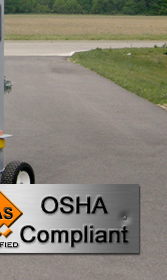 Foam filled tires are more durable in rough environments and are maintenance free. Single-point steering enables easier maneuvering and more accurate spotting. Serrated decking on the platform provides a permanent non-slip grip. Folding outriggers and stabilizing jacks widen the support base for added safety. The working range is from 10’-3" to 14’-0" feet. This unit can be modified to meet your requirements. 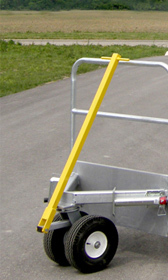 This portable loading access unit has four wheels for added stability with the front two closer together than most portable loading or access platforms. This gives the additional stability of two wheels, but allows the user an advantage of having single point steering for spotting accuracy. The four outriggers and stabilizing jacks widen the support base and help prevent tipping.